Day held on to claim his first-ever PGA Tour victory, despite finding water on the 18th hole. 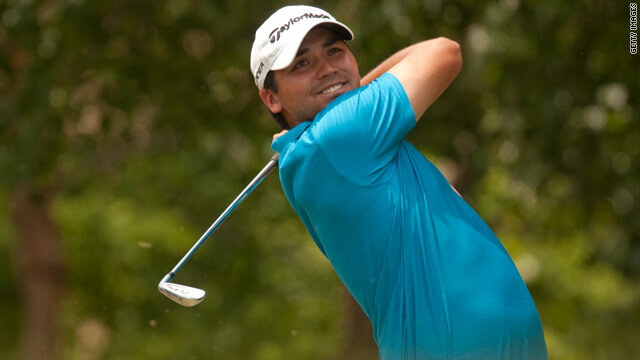 (CNN) -- Jason Day secured his first-ever PGA Tour victory when winning the Byron Nelson Championship on Sunday, despite finding water with his approach to the 18th hole. The Australian carded a two-over-par 72 for a 10-under-par total of 270, but still finished two strokes clear of American trio Blake Adams, Jeff Overton and Brian Gay -- who powered to a closing seven-under-par 63. Day looked to have blown his chance when failing to find the green on the final hole, but remarkably playing partner Adams then found water with his approach shot to ruin any chance he had of victory. "Looking back at it, I think it's going to be one of those holes that I want to forget," Day told the official PGA Tour Web site. "But it is one of those holes that I want to remember as well because it was my first win," added the 22-year-old -- who managed to seal his success despite carding six bogeys in his final round. Aside from Day's victory, the big story from the TPC Four Seasons Resort was the performance of teenager Jordan Speith. The 16-year-old eventually finished tied for 16th place on 276 after, at one time, moving to within three shots off the lead. "It was awesome, the entire round, the entire week," Spieth, the reigning U.S. Junior Amateur champion, told reporters. "Starting the week, I definitely would've taken a top 20 finish, in a heartbeat."